15 August 2017. An injectable soft mesh patch seeded with cardiac cells is shown to fix damaged heart tissue in tests with lab animals, as an alternative to open-heart surgery. A biomedical engineering team from University of Toronto describes its discovery in yesterday’s issue of the journal Nature Materials (paid subscription required). Researchers from the lab of chemical engineering professor Milica Radisic are seeking new methods for treating heart disease that enable patients to avoid open-heart surgery. Despite advances in tissue engineering that create new heart tissue to repair damage from heart attacks and failure, including earlier work in Radisic’s lab, these new advances still require surgery to implant replacement tissue or scaffolds to grow new tissue, which poses additional risks for patients. 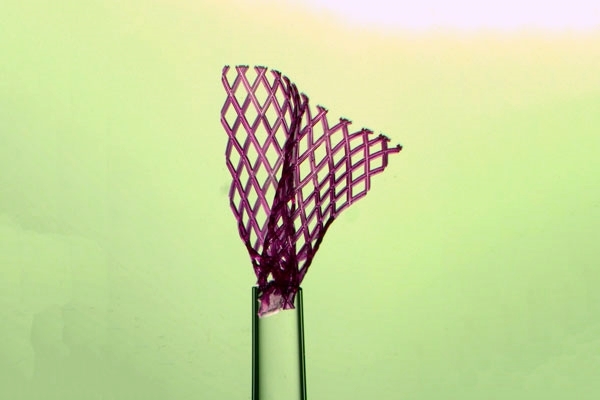 Previously, Radisic and colleagues devised a technique for growing heart tissue outside the body called an AngioChip that starts with a biodegradable polymer scaffold enabling functioning organ cells to grow into three-dimensional tissue. As described in Science & Enterprise in March 2016, the researchers say this process results in stronger, more realistic tissue — including blood vessels — than most current lab methods growing tissue as flat surfaces. The challenge, however, is finding a way of getting a patch to the damaged heart without surgery. “If an implant requires open-heart surgery,” says Radisic in a university statement, “it’s not going to be widely available to patients.” After a heart attack, she adds, the heart’s functioning is reduced, with surgery often posing more dangers to patients than benefits. In their new study, a technique developed by doctoral candidate Miles Montgomery offers a possible alternative to surgery. The researchers began with the same basic material used in the AngioChip, a biocompatible, degradable, and elastic polymer with the abbreviation Pomac. In this case, the team designed a microscale mesh structure from Pomac that could fit into a syringe, yet still remember its original shape after being injected. The researchers succeeded in squeezing a 1 centimeter square patch through a pipette an opening as small as 1 millimeter. Lab tests of the material showed the scaffold would unfold into its original shape once through that small space. The team then seeded the scaffold with precursor heart muscle cells called cardiomyocytes, which can grow into heart tissue, but are sensitive and could be damaged when put under the strain of injection. In tests with lab rats and pigs, however, results show the mesh scaffold unfolds to almost its original shape and size, with cardiomyocytes surviving the folding, injections, and subsequent unfolding largely intact. The team also tested the injectable patches in lab rats induced with heart damage. In these tests, patches injected into the rats’ hearts succeeded in growing new blood vessels and restoring at least some heart functions, compared to rats left untreated. “It can’t restore the heart back to full health,”notes Radisic, “but if it could be done in a human, we think it would significantly improve quality of life.” Long-term functioning and stability tests of the patch are now planned. The researchers applied for patents on the technology. In addition, Radisic and colleagues in Toronto are founders of Tara Biosystems, a company in New York commercializing their work on tissue models for toxicology testing and drug discovery. The company, started in October 2014, is co-founded by researchers from Columbia University and MIT.